AIRTHREY CASTLE MATERNITY HOSPITAL, BRIDGE OF ALLAN The hospital opened c.1941 in the mansion house, a daring design by Robert Adam in his castle style. However, it had closed by 1969 when the new maternity unit opened at Stirling Royal Infirmary. 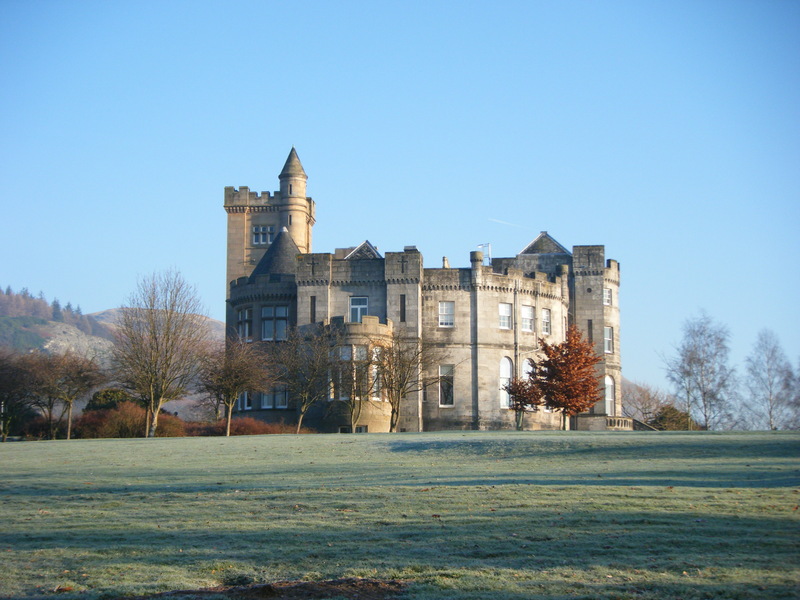 The estates of Airthrey Castle were built on to form Stirling University. 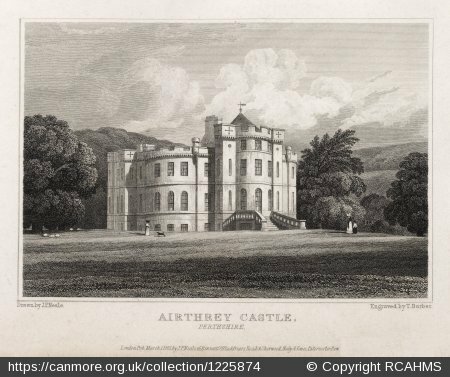 Adam drew up designs for Airthrey Castle in 1791, but was not involved with its construction. Building work was supervised by Thomas Russell of Seton. The entrance front was rebuilt in 1891 to designs by David Thomson for Donald Graham, the chief partner in the firm of William Graham & Company, East India Merchants, of Glasgow. The interiors were fitted out with rich carved panelling, still in situ. He had purchased the estate in 1889, but died in January 1901 of erysipelas. After his death the house remained in his wife’s ownership, but in 1924 the shipowner Charles Donaldson took a five-year lease of the estate. He died at the castle in December 1938. At the outbreak of the Second World War the Estate was acquired by the Ministry of Health as an Emergency Maternity Hospital administered by Stirling County Council, taking patients from Stirling and Clyde. It remained in the ownership of the Graham family until after the war, having been put up for sale in November 1944. With the foundation of the National Health Service the hospital passed to the Western Regional Health Board. A nurses’ home was built in 1953 to the south-east of the house. This L-shaped, two-storey, flat-roofed building appears to have survived and was in use as a surgery/health centre for the University in the 1980s. In 1965 arrangements were made for the transfer to the new University of Stirling of the Airthrey Castle Estate, although it remained in use as a maternity hospital until 1968-9. It was replaced by new maternity units in Paisley and Stirling. The castle was listed in 1973 category B.
sources: Edinburgh Evening News, 23 Jan 1901: Dundee Courier, 1 Jan 1924: Western Daily Press, 8 Dec 1938: Dundee Courier, 15 Jan 1940: Dundee Evening Telegraph, 21 Feb 1944: PP ‘Report of the Department of Health for Scotland…’ 1953 c.9107: PP ‘Scottish Home and Health Department Review of the Hospital Plan for Scotland’ 1966 c.2877: OS maps. I have just come across a conservation plan for Stirling University by Simpson and Brown which includes a history of the Castle and the landscaping, it can be accessed here. This entry was posted in country house, Maternity Hospital, Scottish Hospitals and tagged architecture, architecure, country house, hospital, Maternity Hospital, Robert Adam. Bookmark the permalink. Hello James, uncertain if your interest in Airthrey Castle Maternity Hospital remains. I was born there in 1946….. I was born here in 1946.airthrey castle hospital .1946. looks beautiful.cant believe I finally found a photo of it .x. Hello , what documentation do you have about the November 1944 Knight Frank & Rutley sale ? I am doing an investigation about this particular sale and I am not able to find ANYTHING regarding the auction. Please get in contact with me to see if you can help me ! Have you tried the National Monuments Record of Scotland? Local libraries or the county archives would also be likely to have useful records. Do you have a website ? Some useful link ? Thank you ! I remember my mother telling me when she arrived at Airthrey Castle the snow was very deep,and she was carried up the stairs of the Main Entrance by Staff at the Castle. She described the room she was in as having round walls. I was around 12yrs when she told me about this,unfortunately I dont remember anything more about what she said. I’am at present researching my Family Tree and would like to know about anything happening around the time of my Birth at the Castle.in 1940. It would be fascinating to have a look at the local newspapers from that time. You should be able to do this online through your local public library. I was born UPSTAIRS in the castle Dec. 1942 (Dianne Hendrie). My best friend was born downstairs Feb.1943 (Janette Turnbull). She tells everyone I am older than her. My revenge is to say I was born UPSTAIRS, lol. Robert O’Brien,my cousin, also born at Airthrey Castle. Born here in April 1944 like many folk from Clydebank after the Blitz. My father said he had to take three buses to get to Airthrey Castle from Clydebank to visit my mother.